Orleans was a drama about the Charbonnet family of New Orleans, consisting of Luther, a respected judge, and his sons Clade, a police officer, and Jesse, an assistant district attorney, plus his daughter Paulette, manager of the city's principal riverboat casino. The show first ran from January through April, 1997. A new one-hour drama focusing on the Charbonnets, a prominent New Orleans family, whose trails and tribulations have led heac of the members down different paths of life. larry Hagman stars as the Honorable Judge Charbonnet, a complex man whose love of the law and his children ultimately guides his decisions as the patriach of a troubled, but passionate family and judge in one of the world's most quirky, colorful cities. The ensemble cast also includes Brett Cullen as the oldest son, Clade, a cop fighting corruption on the street and within the New Orleans Police Force; Colleen Flynn as Luther's rebellious daughter, Paulette; and Michael Reilly Burke as Luther's youngest son, Jesse, who has returned to New Orleans as a deputy District Attorney. Lynette Walden portrays cousin Rene Doucette and Vanessa Bell Calloway is attorney Rosalee Clark. ORLEANS, the newest ensemble drama series from multiple award-winning producer/writer/director John Sacret Young and Paramount Network Television, brings the color, mystique and rich tradition of one of the world's most famous cities to life with the story of the Charbonnes, a prominent New Orleans family whose members are often at odds, even on opposite sides of the law, but ultimately stand together in their love for one another. Larry Hagman, in his return to series television, heads the ensemble cast as Judge Luther Charboneet. Orleans premieres with a two-hour episode on Wednesday, January 8 from 9:00 - 11:00 p.m. ET/PT and will air in its regular one-hour timeslot on Wednesdays at 10:00 p.m. ET/PT, beginning on January 15. ORLEANS is filmed entirely on location in New Orleans and its environs, and is inspired by experiences of Co-creator/Co-executive Producer/Writer Toni Graphia, who is the daughter of a prominent Louuisiana judge. Young and Graphia are co-creators of the series, and Young also serves as executive producer/writer/director. Young, and Graphia, bring to ORLEANS a flare for finely-drawn characters and vivid sense of place and time, familiar to audiences of Young's critically-lauded television series, "China Beach," and "Vr.5," as well as other works such as the award-winning feature film, "Testament" and "Romero." ORLEANS features an ensemble cast led by Hagman as the Honorable Judge Luther Charbonnet. Luther is a complex man whose love of the law and his children ultimately guide his decisions as the patriach of a troubled, but passionate family and a judge in one of the world's most quirky, colorful cities. A lover of good times, good food, gambline and horse racing, he is equally devoted to upholding the law. He'll tear up a wad of money rather than accept a bribe. The cases on Judge Charbonnet's courtoom docket reflect the bawdy character of the city of New Orleans, from a lighthearted look at an oddball lawsuit over an alligator attack or a crawfish kidnapping, to a dark and brutal mob murder. Luther adjudicates using methods that are often unorthodox but always fair. In his private moments, Luther still grieves over the disappeanace of his then six-year-old daughter Claire, an unsolved crime which destroyed his marriage and distanced himself from his remaining three children. Luther's oldest son Clade (Brett Cullen) is a top New Orleans Police Department detective, who finds himself fighting corruption not only on the street but within the police force. While Clade shares his father's love of justice, the two men have never been close, and their strong wills often clash. Daughter Paulette (Colleen Flynn) is a rebel with a checkered past, who resents that the memory of her missing sister overshadows her in Luther's affections. As the manager of a riverboat casino, Paulette rubs shoulders with the mob and walks a fine line between the right and wrong side of the law, much to the consternation of her father and brothers. Jesse (Michael Reilly Burke), Luther's youngest son, is a deputy District Attorney who has recently returned to New Orleans, after living in California with his mother. As the newest D.A., Jesse finds himself confronting the mob's influence in his home town. Despite his own struggles, Jesse, with his quiet charm and steady wit, becomes a unifying force for the fractured Charbonnet family. Rounding out the cast is Charbonnet cousin Rene (Lynette Walden), a fiery agent with the Wildlife and Fisheries Agency. Additionally, Vanessa Bell Calloway portrays Rosalee Clark, a prominent defense attorney who frequently opposes Jesse in the courtroom, and who forms a conflicted relationship with Luther. John Sacret Young, also directs several episodes of ORLEANS. "We're fortunate to have an exceptionally strong ensemble cast to bring these characters to life," he comments. "When we think of Larry Hagman, we think of 'I Dream of Jeannie' and 'Dallas', but the truth is he has had a long and rich career, a formidable body of work, not only in television, but in theatre and film as well, from his wonderful work in 'Fail-Safe' (1964), and 'The Group' (1966) to his recent appearance in 'Nixon'. Larry has amassed a remarkably diverse and distinguished body of work, and he's lived a complete life, most recently, of course, with his liver transplant, all of which is evident in his portrayal of Luther. In addition to a bold spirit and devilish humor, Larry brings an integrity and vulnerability, even a nobility, to Judge Charbonnet. It's astonishing work." Hagman takes on the role of Luther in his first television series since the 13-year run of "Dallas" (1978-1991) which made him a household name as the villainous millionaire, J.R. Ewing. 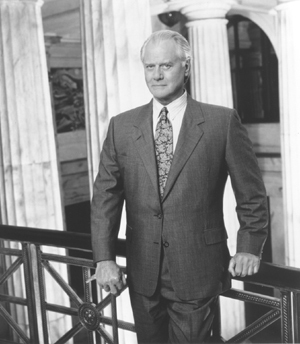 Prior to leaving for New Orleans, Hagman filmed the "Dallas" television movie, "J.R. Returns," which ranked number one the night it aired on CBS-TV in November, 1996. ORLEANS came to fruitation from a chance conversation between Young and Graphia, who, with many hours of episodic television to her credit, including "Life Goes On" and "Quantum Leap," was looking for her next project. In talking with Young, who helped launch her writing career by encouraging her to write an episode of his lauded series, "China Beach," Graphia mentioned that people kept asking her why she didn't write a series about her family in Louisiana. Graphia relates, "Somehow I never warmed up to the idea until John and I began talking about the possibilities, and came up iwth the concept for ORLEANS. We wrote a treatment and had a deal that same week." The character of Luther Charbonnet is inspired by Graphia's father, Tony Graphia, a recently-retired Louisiana judge who serves as a technical advisor to the series. Prior to his retirement, Graphia's father served in just about every capacity in Louisiana's legal system, from district attorney to public defender to judge. "So I have plenty of material to draw on," says Graphia. "I observed judges' meetings with my dad, and John and I sat in on a number of trials in New Orleans before we went into production." She adds, "New Orleans is a fascinating setting for a legal drama. The city is deeply conservative and wildly decadent at the same time. Right now there's a huge controversey about legalized gambling, which has citizens outraged; then the new local option bill, allowing each parish (the Louisiana term for county) to choose to legalize gambling or not, has the gaming business outraged. So there's a lot of wheeling and dealing going on." "There's a saying in New Orleans that the people don't expect good government from their politicians, but they do expect good entertainment," Graphia laughs. "Luther's challenge is to provide both." Throughout ORLEANS' first season, distinguised guest stars will join the ensemble cast. They include: Charles Durning as Frank Vitelli, a mob chieftan; David Ogden Stiers as John Lafitte, a crooked judge; Cotter Smith as a district attorney; Charles Neville as a blues singer and Ralph Waite, a guest-star in the two-hour premiere, who reappears in the episode "Babysitting" as Otis, a family friend who betrays the Charbonnets. Fried alligator and blackberry cobbler...they're not your usual crew rations on a television series location shoot, but the ORLEANS cast and production crew was treated to an authentic taste of Louisiana hospitality while filming a scene in the small town of Lockport. "In the first episode, we shot a scene on bridge in this tiny town" relates Toni Graphia, Louisiana native and co-creator/co-executive producer/writer of ORLEANS. "It looked like every single citizen came out to watch the filming, and when we were finished, they came out of their homes with heaping platters of fried alligator and blackberry cobbler - enough to feed the whole cast and crew." Filmed entirely on location in New Orleans and the surrounding towns and countyside of Louisiana, Orleans depicts a region that's as much a character in the drama as it is a backdrop. From the well-known traditions of Mardi Gras and crawfish boils, to the little known "Great Cajun Omelet Festival" - involving 5,000 eggs and 12-foot frying pan - each episode of the series is seasoned with the quirky, colorful character of the area. "We're incorporating as much authenticity as possible, in every aspect of the production," Graphia emphasizes. "In the stories, and in the way we produce them, when the locals watch ORLEANS, we want them to say, 'That's it! That's how it really is.' " She adds, "There's a saying that goes, 'You're not in America...you're in New Orleans,' and that's the feeling we're trying to create. There's no place else like it in the world." The "Great Cajun Omelet" scene in one ORLEANS episode is based on the annual event held in Abbeville, Louisiane, a tradition imported from a small town in France where legend has it that Napoleon ordered an omelet cooked to feed his entire army. The actual 12-foot skillet from Abbeville is used in the scene. In aother episode, Luther (Larry Hagman) experiences a local festival based on the real-life town of Jennings, where each year a tourist driving through is arrested for "failure to stop in Jennings," and is honored at a down-home Louisiana barbeque with the townspeople, and then is sent off with a carload of presents and admonitions to stop on the next trip through. A small bayou community is depicted in another episode, in which the children ride the "school boat" each morning, the preferred method of transportation in swamp regions. For interior sets, the "home base" stage for ORLEANS is located in the heart of the French Quarter, in the former administration building for the Wildlife and Fisheries Department. The four-story govenerment building, with vast halls, grand columns and sweeping staircases, is transformed by the production into courtrooms, jail cells and other interior scenes, all with the rich look and feel of traditional New Orleans architecture. "We invited real-life local judges to be a part of a scene involvning a judges' meeting," says Graphia. "We've also made sure it's the real deal when we portray the local wildlife." In one episode, an entire herd of crawfish crawl out of their pond and cross the road to a neighboring crawfish farm, lured by the strains of classical music. When the scene was filmed, crawfish season had not yet begun, so a massive search for live crawfish began, rather than rely on special effects for the scene. After a falsh lead or two (including problems with crawfish too small for the part) ten 30-pound bags of the full-grown critters were located from a local crawfish farmer, spread out on the road and the crawfish wrangling began. In another episode, Luther stages a reenactment of an alligator attack as part of a rather unusual court proceeding, using a broomstick with a hat and a raw chicken attached to simulate the human victim. The script called for the alligator to leap out of a pond and attach the broomstick, but the trick was finding a tame alligator hungry enough to do it. The solution turned out to be an alligator just coming out of winter hibernation, who had yet to eat his first meal. "There were some doubting Thomasas when we tried it," laughs Graphia. "But that's an actual hungry alligator you see leaping out of that pond." New Orleans has been called a great many things in tribute to its distinctive culture: "The Paris of the Americas," "America's International City," "The Gateway to the Americas," "The City that Care Forgot," "The Crescent City," and "The Big Easy." * ALLIGATOR PEAR - An avocado. * BAYOU - (pronounced Bi-Yoo) A marshy, sluggish tributary of a river or lake. * CAJUN - A descendent of the Acadians, French colonists exiled from Nova Scotia, who settled in southern Louisiana in the 1760s. The word also applies to the type of French spoken by the Acadians. * CITIES OF THE DEAD - Refers to the cemeteries in New Orleans. Because the water table is so high - the city is situated six feet below sea level - the dead are buried above ground in elaborate tombs which resemble a small city skyline. * CRAWFISH - Edible crustacean common to fresh water (nicnamed mudbugs). *CREOLE - Applies to the descendents of the mostly Spanish and French colonists and the culture they created. * GRIS GRIS - (pronounced Gree Gree) A Voodoo charm or amulet. * JAMBALAYA - (pronounced Jam-Ba-Lie-Ya) A local dish made with rice, various meats or seaford and seasonings. * KING CAKE - During the carnival season a special cake (rather like a large pastry or sweetrool) is decorated in Mardi Gras colors. A small bean or tiny doll is hidden inside. When the cake is cut and served, the person who gets the special piece is then declaired "King" for the evening and must host the next King Cake party. * NEUTRAL GROUND - The grassy or cement strip i the middle of the road. In New Orleans the terms "median' and/or "island" are NEVER used. * PARISH - The term for a Louisiana state administrative district, similar to a county in other states. * PO-BOY - (Poor Boy) A sandwich served on long loaves of French Bread. Originally very inexpensive and filling fare, which explains the name. * - TO GO CUP - In New Orleans a bar patron can ask the bartender for a "to go cup" which then can be taken out of the establishment, on to the street, and into another bar for a refill. New Orleans, "the to-go-cup capitol of the world" is the only city in America where tourists can be seen walking the streets, taking in the sights with cocktails in their hand.